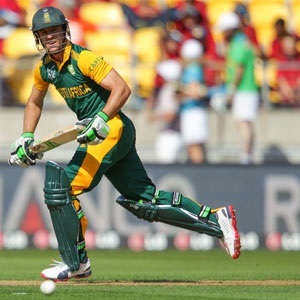 Cape Town – Captain AB de Villiers ending third-highest run-scorer was the Proteas’ standout statistical effort after completion of the pool stages of the 2015 World Cup at the weekend. The dashing stroke-player registered 417 runs at an average of 83.40 from six matches in Pool B, leaving him behind only Sri Lanka’s Kumar Sangakkara (496 at 124.00 in Pool A) and Zimbabwe’s Brendan Taylor, who accumulated 433 runs at 72.16 in the same group as southern African rival De Villiers. Taylor puts his international career on hold now for three years – and perhaps permanently – as he takes up a county contract with Nottinghamshire. The only other South African to crack the top 10 of run-scorers, as the tournament progresses to the quarter-finals, is Hashim Amla in 10th itself, courtesy of 307 runs at 51.16 although more than half his runs came in a single, career-best knock of 159 against Ireland in Canberra. From a Proteas perspective, there were also decent showings in the pool play, where SA ended second to India, from Faf du Plessis (277 runs at 55.40) and David Miller (275 at 68.75). A feature of the “top run-scorers” list is that the best-placed Australian batsman – though the co-hosts suffered one washout -- comes in as low as 17th: David Warner with 264 runs at 66.00. As expected, South Africa have been confirmed as tackling Sri Lanka, third in Pool A, in the first quarter-final at Sydney Cricket Ground on Wednesday (05:30 SA time). As bad weather briefly threatened to wreck the Aussies’ closing pool match against Scotland in Hobart on Saturday, the real risk existed that the Proteas would play the arch-rival Aussies instead, but then there was enough clearance for the Scots to be duly disposed of and Michael Clarke’s team shift up to a second-placed finish. Ending up playing Sri Lanka at the SCG is not the worst outcome in the world for the currently fickle South Africa – it was where they produced their most polished effort of the pool phase by slaughtering West Indies by 257 runs, De Villiers belting 162 not out off a mere 66 balls. Leg-spinner Imran Tahir also shone that day, bagging 5/45 in a personal best at ODI level, and he finished the group stage as the third most productive spinner in the wickets column, taking 11 at an average of 23.36 and economy rate of 4.35. Only superior to him at his trade were New Zealand’s Daniel Vettori (13 scalps) and India’s Ravichandran Ashwin (12). But in overall bowling terms, paceman Morne Morkel, who has not bagged fewer than two wickets each time in his six Pool B appearances, heads the South African charge statistically. More often than not slightly eclipsed by Dale Steyn and Vernon Philander for excellence at Test level, he has been the country’s most consistent and penetrative quickie at the World Cup so far. He sports 13 wickets at 16.38 and an equally praiseworthy economy rate of a fraction above four runs to the over. Philander has been dogged by niggles at the tournament so far, whilst Steyn has seldom been at his vintage best, being responsible for a moderate – by his standards -- nine wickets at 28.00 and economy of 4.75. He is a “big-match” player and many Proteas enthusiasts will be hoping the Phalaborwa Express reserves his A-game for a concerted charge in the knockout phase; if SA get past the ‘Lankans, they will meet the winner of the New Zealand v West Indies quarter-final in an Auckland semi. The leading wicket-takers in the tournament so far are the Aussies’ left-arm surprise package Mitchell Starc (16 at a dazzling 8.50 in only five opportunities) and then a trio of seamers on 15: India’s Mohammed Shami, the Black Caps’ Trent Boult and minnows Scotland’s home-grown Josh Davey.